CAT40 Tooling ER32 ER16 Collet End Mill Holder Drill Chuck Face Mill New. 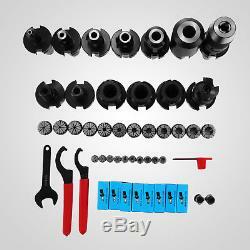 This product includes the following parts. 6PC CAT40 End Mill Holder. 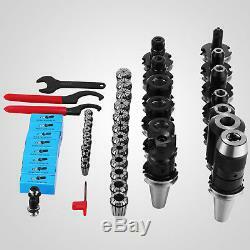 6PC Common Size: 1/4, 3/8, 1/2, 5/8, 3/4, 1. Precision high speed end mill holder for durability and rigidity. 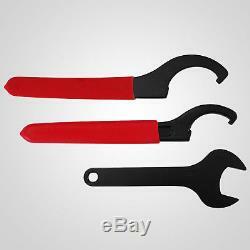 Provides a very close tolerance fit with minimum runout between the tool. Holder's bore and the cutting tool. 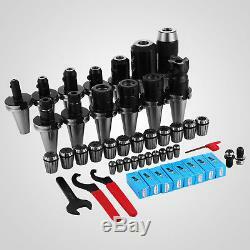 Thru Hole of the tool holder allows the use of Thru Coolant Tools when. Used with a Thru Coolant retention knob. Both ER32 and ER16 Chuck Gage or projection length of ER16 is 2.75. Fully ground flange and V-groove easy on tool changers for less spindle. V-Flange CAT 40 is production balanced to high speed spindle turning and. High Speed True Balance in 15-20K RPM. Even though all sellers are saying balance, but it's not true, few smart guy. Their description or over describe the item. It's easy to find out balance or. Not, set spindle speed higher, and you'll see the difference, could be couple. Thousands, true balanced holder works the same way at low and high speed. Even up 20K RPM, however, poor or not evenly balanced only works. Normally under low spindle speed. Hardened and ground to ensure maximum accuracy. Through spindle coolant capability from pull stud to collets. 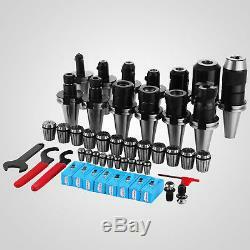 1PC Precision Keyless Drill Chuck. 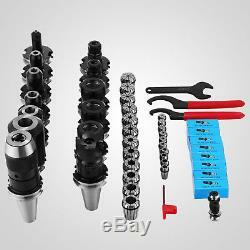 Keyless Drill Chuck 1/2 Capacity. Drill chuck has very strong holding power. V-Flange CAT 40 is production balanced and meet standard industrial. 5PC general purpose carbide inserts. It's a combination of a tough, special cemented carbide substrate and. CVD coated grade for milling of steel up to 30-35 HRC before heat treat. 12PC ER32 Collets Set By 1/16. Made of high grade spring steel. Ground roughness is Ra0.4 Microns, plus overall fine polish. 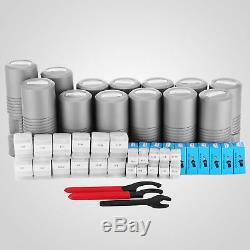 12PC set by 16th: 1/8"; 3/16"; 7/32", 1/4"; 5/16"; 3/8"; 7/16"; 1/2"; 9/16. In order to make all collets running true, on your. Side, make sure your machine spindle and chuck holder running true, on my. Side, I'll make sure all those collets running in tenth. Special angled slots increase rigidity. Better overall balance of tool holder assembly. Protects tool holder from contaminants. 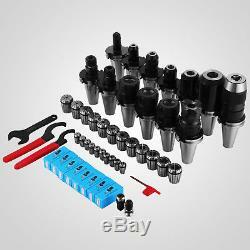 Use with any standard ER collet chucks for coolant-thru tool applications. 10PC ER16 Collets by 1/32. 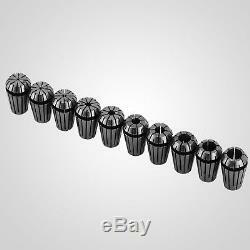 10PC Size: 1/32", 1/16", 3/32", 1/8", 3/16", 7/32", 1/4", 5/16", 11/32", 3/8". 6 X Common size end mill holder. 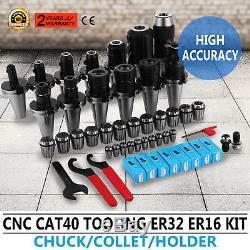 3 X ER32 collet chuck. 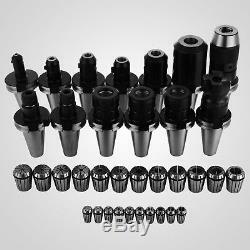 2 X ER16 collet chuck. 1 X 1/2 keyless drill chuck. 1 X Face mill cutter. 12 X ER32 collets set by 1/16. 10 X ER 16 collets set by 1/32. As a leading and emerging company in manufactory and exporting business, we are specialized in Business and Industrial Products, Sporting Goods, Pet Products, Home and Garden products for more than 10 years. We believe that it is our vision and mission to provide innovative products with best service and competitive price to satisfy you. Please contact our customer service before you return an item. The item "35PCS ER16 SUPER PRECISION SET ER32 COLLET 2'' FACE MILL CUTTER CNC CHUCK NEW" is in sale since Monday, September 24, 2018. 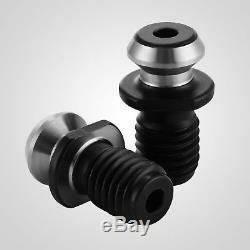 This item is in the category "Industrial\Metalworking\Chucks". The seller is "techstylegroup" and is located in Sydney.